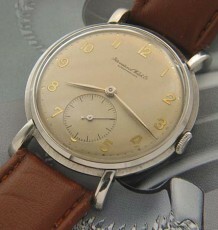 IWC stainless steel vintage watch, sought after sub-seconds movement. This vintage IWC is the first I have seen fully signed by the Swiss retailer Gubelin. 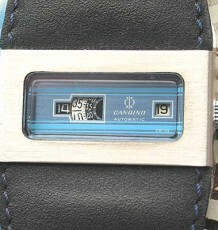 The dial has been restored due to excessive ultraviolet tarnish of the dial lacquer. 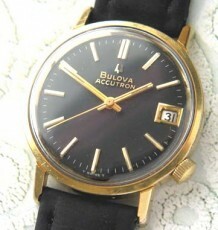 However please note the otherwise mint condition of the movement and case of this truly remarkable watch. The other thing to note is that the case does not appear to have ever been polished so the dial and case condition together indicate this watch must have sat in a display window for decades prior to being sold as it has virtually no wear to it. The movement is the highly regarded IWC calibre 83 manual wind movement. 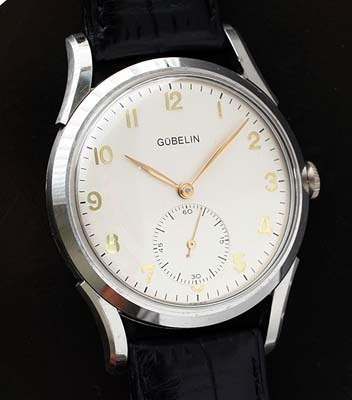 What is truly rare is the fact that the movement is not actually signed International Watch Company but rather E. Gubelin, Switzerland, 17 jewels. One has to look carefully under the balance wheel to see the movement identifier C83, which is the marker to show this to be the highly sought after IWC calibre 83. Collectors of military watches will already know that the calibre 83 movemnt was the same model used in the Royal Air Force Mk 10 issued timepieces. The combination of movement choice with case size and design suggest this watch dates to the early 1950’s. The stainless steel case measures a larger than normal 36 mm wide by 45 mm long. 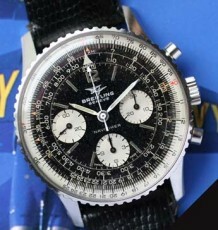 The watch is supplied on a new leather strap.